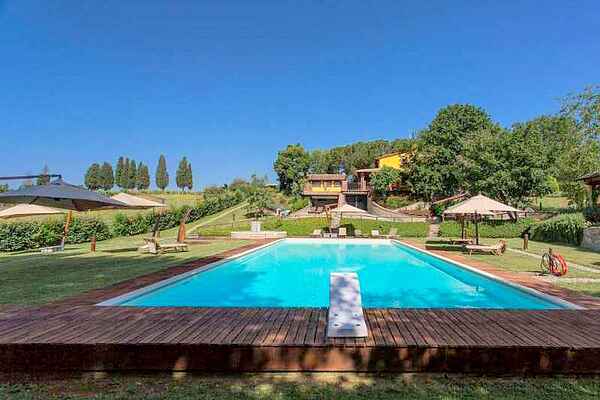 The country house, just on the slopes of the Pratomagno Mountain, is really a hidden angle of the wonderful Tuscan countryside, offering beautiful views over the colourful hills. The country house is located in a really strategic position for the art cities such as Florence, Siena and Arezzo are all within easy access. The country house will really fascinate you thanks to the Tuscan atmosphere you can breathe walking through the paths of the estate: vineyards, olive groves, secular oaks, pines, orchards, sunflowers, the typical sounds of animals and the typical scent of threshed hay that fill the air. The stay at this country house is perfect for guests who want to relax, maybe by the splendid swimming pools (a big rectangular one and a small round one provided with hydro-massage) and for more dynamic people, who want to keep fit in the gym or sauna with relaxing view over the pool. If guests like walking or horse riding, immersed in the Tuscan hills and its perfumes, this is also the right place. The estate offers five comfortable apartments recently refurbished maintaining the typical elements of the Tuscan style, like exposed beams, the famous Florentine terracotta and the wrought-iron beds realized by the experienced local blacksmiths. Each apartments is furnished with antiques, but taking into account all the needs of a modern living. The property has been built in an environmental-friendly spirit with solar panels and a photovoltaic roof. The windowed wall of the kitchen gives a pleasant brightness to the characteristic dining area. A wooded staircase (16 steps) leads to the first floor opening directly onto the Master bedroom with bathroom. Guests can dine outdoor in their private garden fully equipped with table and chairs. Do you like italian food? during your stay in this holiday home, you can choose to follow cooking lessons! - location: a nearby restaurant - what: you will prepare a full menu - cost (in 2008): Eur 100 for the lesson and the meal after the lesson (wine included). If you book 3 lessons, the price per lesson is Eur 85. If you like wine, you can choose for a wine tasting session, consisting in: 1 hour visit, explained by a wine producer and 3 different wines' tasting. Cost: Eur 18 per person. Please contact us before your stay if you are interested in these sessions. There needs to be a minimum of participants for these sessions to be held.